Elizabeth Stoker Bruenig has an article up at Salon (real Salon, not parody) arguing the Christianity is becoming a left-wing phenomenon, which is not a surprise to readers of Occam’s Razor as we’ve had posts here such as “Is Christianity Inherently Left-Wing and Egalitarian?” On the global scale, Christianity is becoming a non-Western, Third World religion, which means that Christians globally will tend to support things like redistribution of wealth from whites to non-whites, as well as dispossession of whites from their own lands (aka Third World immigration). What’s particularly interesting is the role that mainstream Christian churches are playing in the current boarder crisis along the US-Mexico border. Not only are these Christian churches supporting the invasion, they are facilitating it, and with US taxpayer money. As recently noted by Refugee Resettlement Watch, the Catholic Church, as well as other Protestant churches such as the Baptists and Lutheran Church, are getting millions of dollars of taxpayer money to facilitate the refugee invasion of the USA. It’s disgusting. What will be the reaction? Already, you see younger people leaving mainstream Christianity for things like Pro-Western Christianity or neo-paganism. If trends on Twitter are any indication, anti-Pope Francis images like this floating around suggest that conservatives might be getting fed up with mainstream Christianity. When was it – maybe two or three years ago? – that the open-borders folks were assuring us that there was nothing to worry our little heads about, ’cause illegal immigration was over, ’cause the economy was so bad – or something like that. Where are they now, as countless women & children, heeding Obama’s summons, flood across our Southern border? 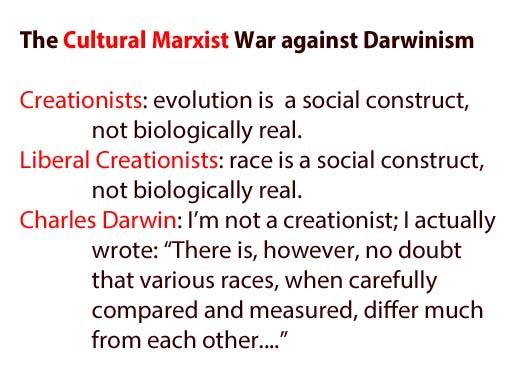 New Creationism can be thought of as the anti-Darwinian religion of many of the far Left. New Creationists: Those who profess to believe in Darwinism but deny biological reality of race and seem to think that human evolution for past 50k years has occurred only from the neck down. In other words, New Creationists believe in miracles. In short, New Creationism is the religion of the Cathedral. As the Cathedral subscribes to an ideological form of radical universalism, New Creationism naturally follows from this. And the religious implications are not accidental. Just as many modern values are mere secularized Christian virtues (cf. MacIntyre), so New Creationism is a secularized form of the Christian idea of the unity of mankind through Adam & Eve. The mere thought of taking evolution seriously — i.e. that human biodiversity naturally follows from evolution — is a horrifying thought to the gatekeepers of the Cathedral, so horrifying that the nakedness of evolution must be clothed with the shroud of New Creationism. To see how much like a religion New Creationism is, look at all the scientific fraud of the last 100 years to promote New Creationist myths. The New Creationist meme is really catching on. See here and here.